layout to originality, amount of detail, etc. The sole other entry was from ChickenFist; download it here. Overall, this map was the best balanced in terms of having a good layout, nice brushwork and interesting gameplay (which was a nice surprise) The setting and placement of the house was very nice and combined the tram ride, lift and house quite in a very logical way. From the beginning, we must work our way through the cliffs of Black Mesa, knowing that something is going on above. When we actually get inside, we must fight against a squad of grunts. 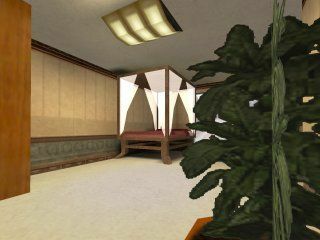 Texturing and furniture are OK overall in this map, and some details like an aquarium full of Xen stuff hints that the Administrator has indeed some special privileges. This entry begins inside the Black Mesa tram system, and takes us through some passages sporting nice and interesting architecture. We are also treated with custom sounds and skins, as well as game_texts that add to the atmosphere and quickly puts us in the middle of things. We even have scripted sequences, scripted_sentences and a reference to the original HL plot. We can feel this is a part of the same story. The inside of the house is very nicely textured and full of detail. Of all the entries, this one had the best and most detailed architecture. 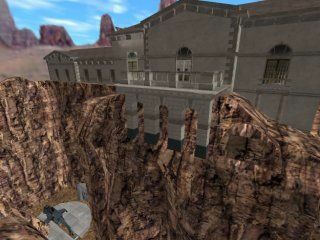 The outside cliffs and house are outstanding from a technical point of view, as well as the area near the train tunnels. There was also a good surprise hallway in which not everything is as it seems. On the down side, there wasn't much inside the house which actually indicated we were in the Administrator's house. 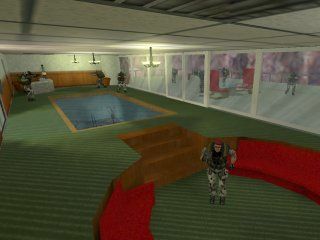 The HL2 music and combine helicopter were a nice addition to the map, but other aspects such as several compiling problems seemed to have been overlooked. Processed in a fatally ambiguous 1588 jiffies.